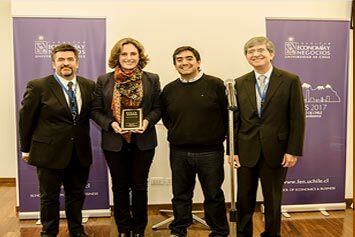 The Business Administration Department of Universidad de Chile's Faculty of Economics and Business (FEN) organized the BALAS annual conference 2017. The central theme was "Surpassing the Emerging Country Threshold: Challenges for Businesses and Government". 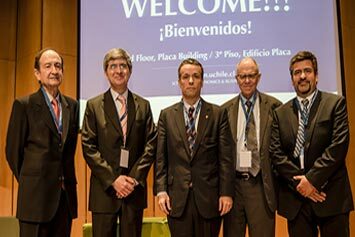 A total of 110 leading academics, managers and decision makers had the opportunity to participate in the BALAS 2017 Conference: these came from more than 12 countries, such as Brazil, Mexico, Spain and Japan, among others. BALAS 2017 represented a very special opportunity to share ideas regarding research interests and policy development between American and European countries. After a rigorous blind review using the highest academic standards, 80 papers were accepted and selected out of the 123 papers that were submitted. With this revision and selection process, it is possible to ensure that the conference excels at bringing together, in a consistent manner, a group of the world's leading academics in the disciplines related to business. Thus, BALAS fulfills its objectives of providing new knowledge, and experience and the opportunity overcome the barriers that thwart the creation and sharing of knowledge. The papers that were presented at the conference were distributed in a total of 25 parallel sessions. The event began with a plenary session where the lecture, "Surpassing the Emerging Country Threshold: The Role of Companies", was given by Oscar Landerretche, Chairman of the Board of Coldeco, the largest state-owned copper mining company in the world. In his presentation, Mr. Landerretche analyzed the performance of Coldeco, and the main changes implemented during his management, which, not only, have helped increase production, but also have ensured greater transparency. At this same plenary session, the Commercial Engineer Hans Eben, well-known for his role as director of several companies, and also alumnus of our Faculty, presented the lecture "Challenges for companies and governments of emerging markets in the XXI century". Eben explained the main changes of the world in which we are living, and how to adapt to them within the work market, family, and interpersonal relationships. On the second day, the plenary session was in charge of Peter Brews, Dean of the Marla Moore, School of Business of the University of South Carolina. His lecture was "Challenges for government, business and business schools." The President of Chile's National Productivity Commission (CNC) andformer Dean of FEN, Professor Joseph Ramos, participated in the final plenary session, where he addressed the challenges for the development of emerging countries, in which the productive diversity is essential for aspiring to a permanent and sustainable progress over time. The second speaker in this final session was the Assistant-Secretary of Finance of the Chilean Government and former scholar at FEN, Alejandro Micco. Mr. Micco highlighted the strengths of Chile in macroeconomic issues, and elaborated on the efforts the country is making to become a relevant services exporter in Latin America. The conference was held in Santiago, capital of Chile, and its economic, political and cultural center. 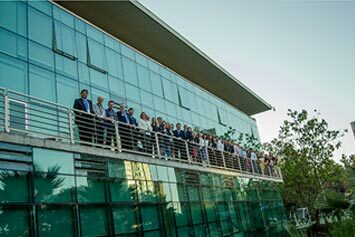 The academic activities of BALAS 2017 were carried out in the Universidad de Chile's Faculty of Economics and Business campus, which is located in the historic center of Santiago. The participants were able to enjoy a tour to the Concha y Toro vineyard, visited its park and manor house, tasted several kinds of grapes and learned about the wine production process in Chile. The official gala dinner was held at the top of the city, where every partaker was able to enjoy impressive views of the city and the mountain range. They also had the opportunity to enjoy typical Chilean dances presented by the Antumapu group, Universidad de Chile's distinctive folkloric dance troupe. We would like to thank the following sponsors for their contribution to make the conference possible: Graduate School of the Faculty of Economics and Business of Universidad de Chile, UNegocios FEN, BALAS, Euromonitor International, Cengage Learning and Crowne Plaza Santiago Hotel. El Departamento de Administración de la Facultad de Economía y Negocios de la Universidad de Chile organizó la Conferencia Anual de BALAS 2017, que tuvo como tema central: "Surpassing the emerging country threshold: Challenges for Businesses and Government". Con la presencia de 110 destacados académicos, gerentes y tomadores de decisiones de más de 12 países, tales como Brasil, México, España y Japón, en BALAS 2017 se generó la oportunidad de compartir ideas, intereses de investigación y desarrollo de políticas entre países de América y Europa. Tras un riguroso proceso académico de revisión anónima de pares, se presentaron los 80 mejores trabajos de un total de 123 que respondieron a la convocatoria. Luego de esta revisión y selección, es posible asegurar que la conferencia cuenta con un grupo de académicos de relevancia en el mundo en el área negocios, que aporta así nuevos conocimientos, tendencias y experiencias para de esta forma buscar desplazar la barrera del conocimiento. Los trabajos presentados en la conferencia fueron distribuidos en un total de 25 sesiones paralelas. El evento comenzó con la sesión plenaria " Surpassing the Emerging Country Threshold: The Role of Companies", dictada por Óscar Landerretche, Presidente del directorio de la Junta de Coldeco, la minera de cobre estatal más grande del mundo. En su presentación analizó el funcionamiento de la cuprífera y los principales cambios implementados durante su gestión, los cuales además de aumentar la producción, también aseguran mayor transparencia. En esta misma sesión plenaria, el destacado director de empresas, también egresado de nuestra Facultad, el Ingeniero Comercial Hans Eben, realizó la plenaria "Desafíos para las empresas y el gobierno de los mercados emergentes en el siglo XXI", en la que explicó los principales cambios del mundo en el que nos está tocando vivir y la adaptación a ellos tanto en el mundo laboral, familiar y de relaciones interpersonales. El segundo día, la sesión plenaria estuvo a cargo de Peter Brews, Decano de la Marla Moore School of Business, Universidad de Carolina del Sur. Su charla se tituló "Challenges for Government, Business and Business Schools". El Presidente de la Comisión Nacional de Productividad en Chile y ex decano FEN, profesor Joseph Ramos, fue el responsable de participar en la sesión plenaria final, donde se refirió a los desafíos para el desarrollo de los países emergentes, donde la diversidad productiva es fundamental para aspirar a un progreso permanente y sustentable en el tiempo. El segundo exponente en esta sesión final fue el Subsecretario de Hacienda del Gobierno de Chile y ex académico FEN, Alejandro Micco, quien destacó las fortalezas de Chile en materia macroeconómica y detalló los esfuerzos del país para convertirse en un exportador de servicios relevante en América Latina. Adicional a lo anterior, se desarrolló una Paper Development Session con editores de dos prestigiosas revistas académicas latinoamericanas: Carlos Pombo, Editor de Revista Latinoamericana de Adminstración (Emerald Group) y Carlos Heitor Campani, Editor de Latin American Business Review (Taylor and Francis). La conferencia se realizó en Santiago, capital de Chile, y centro económico, político y cultural de este largo país. Las actividades académicas de BALAS 2017 se llevaron a cabo en las dependencias de la Facultad de Economía y Negocios de la Universidad de Chile, que se emplaza en el centro histórico de la ciudad. Los participantes de BALAS pudieron disfrutar de un tour a la viña Concha y Toro en el que conocieron parques y casonas, degustaron vinos y conocieron el proceso de producción de este producto típico chileno. La cena de gala oficial de la conferencia se realizó en lo alto de la ciudad, donde los asistentes disfrutaron de una inmejorable vista a la capital y a la cordillera. Además, tuvieron la oportunidad de disfrutar de los bailes típicos chilenos, a cargo del ballet folclórico Antumapu quienes son sello distintivo de la Universidad de Chile. Nos gustaría agradecer a los siguientes patrocinadores cuya contribución hizo posible la conferencia: Postgrado FEN Uchile, Unegocios FEN, BALAS, Euromonitor International, Cengage Learning y Crowne Plaza Santiago Hotel.